The Rogue Pea Marketing Blog: Branding your small business: time for a makeover? Purpose of this blog post is to provide a straightforward way to begin a brand makeover. This seems to be a sticking point for many small business owners – where to begin?! Start at the beginning: what is branding? Branding. It's more than a just a logo, slogan and company colours. A brand is how your business is known by the customer – it is the combination of the qualities, customer expectations and value your business provides. Sounds complicated but it isn’t. No master's degree or marketing firm needed either. In fact, since YOU know your business best, drawing on your own knowledge and familiarity about your business and your customers is the best way make your brand stand out. It comes down to asking the right questions, focusing your answers and then using that information to build your brand. 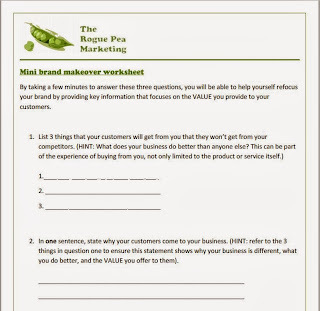 Below is a short, to-the-point brand makeover worksheet. By completing the questions, you will be on your way to reinvigorating your brand, whether you are brand new to the game, or an old pro. By taking a few minutes to answer these three questions, you will be able to help yourself refocus your brand by providing key information that focuses on the VALUE you provide to your customers. Download it FREE. Here is a screen grab to see for yourself. 2. In one sentence, state why your customers come to your business. (HINT: refer to the 3 things in question one to ensure this statement shows why your business is different, what you do better, and the VALUE you offer to them). 3. Make a list of the TOP 3 things you would like your business to BEST be known for. These questions provide a great baseline for building (or rebuilding) your small business brand as they answer the right questions. The key is defining what sets your business apart AND provides value to your customers. As always, I am happy to discuss any questions or clarifications that may help you complete this worksheet. Enter a comment below, or go directly to my Facebook page where this post will be listed as well. I am here to help – ask questions!